Inventory changes constantly. Throughout each day, sales, returns, new receipts—even damage and theft—affect your stock levels. While daunting, keeping track of it all is one of the most important jobs in a successful retail operation. Here are seven reasons it needs to be a top priority. • Quickly see which products are running low. • Compare the stock level with sales, especially strong selling items. • Place reorders before stock runs out. Depending on the inventory software you use, consider setting minimum stock levels for automatic purchase ordering. You can factor in fulfillment and lead time when setting the limits, so that when the minimum stock level threshold is reached, the system quickly issues a new PO. 2. Better-invested cash. Success in retail requires wise investment of cash by buying the right quantity of each product – enough to keep sales going and prevent stock-outages, but not so many items that some languish on the shelf. Maintaining accurate inventory reports helps to quickly identify slow-moving products, so you can mark them down and clear them out—freeing up cash to invest in other areas of the business like new products and marketing. 3. Early problem detection. By keeping an eagle eye on your inventory levels, you can spot problems immediately, instead of months later during annual stock counts when they may have already cost you a lot of money. 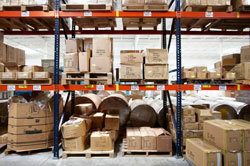 Is there a missed step in your warehouse process, or a salesperson making mistakes? The best way to know ASAP is by constantly reconciling sales and purchases through a tightly maintained inventory system. 4. Happier customers. Exact inventory reports also help you provide better customer service to build trust and loyalty. When customers claim they haven’t received an ordered product, you can check your report and confirm stock availability. With a stock system up to date with purchase orders, you can sell customers the products they want, knowing fresh stock is on its way. 5. Efficient reordering. Reordering is fast and easy if your reports tell you what’s in stock. You can work methodically through your product set, making informed buying decisions instead of physically checking your stock storage to write each purchase order. If your reports come from an advanced inventory management system, you also can tell if you already have products on order and if that supplier has long lead times or irregular deliveries. This information is a must if you want to keep reordering under control. 6. Trusted information systems. Running an efficient and profitable business is about sharing and using accurate information, usually through an integrated system. If your employees know that the stock levels in your system are always up-to-date, they’ll trust the software and use it more for all of their tasks. You’ll end up with better data for better reporting, collaboration, and efficiency across the team. 7. Reduced storage costs. When your inventory report tells you what you have in stock, the pick-pack-ship process runs more efficiently. Warehouse or storage room staff need not run around looking for the last product, because you know exactly when it sold and was shipped. This enables you to process more orders in the same amount of time with the same staff. Accurate stock levels can keep your business lean! At Giantnerd, a direct to consumer supplier of Tomasso bikes and gear, we use a combination of technologies, including Shopify, BrightPearl and ShipStation, to help us to keep on top of inventory and operations to better serve our customers. All the software we use has great flexibility—we can always add more features and functions so we have the ability to adjust as the business grows. We’ve grown over 34% in the past year, and that’s given us the time to focus on our customers instead of worrying about inventory management. For growing retailers, especially those adding locations or channels, inventory management can seem overwhelming, but a little focus on this foundational piece of your business can bring big efficiencies and profits across your channels. Justin Essler is general manager at Giantnerd (www.giantnerd.com), a direct-to-consumer supplier of Tommaso bikes, as well as shoes and cycling accessories. With a showroom in Denver, CO., the team is committed to providing cycling enthusiasts with stellar customer satisfaction, both online and in-store. Selling on two Shopify stores, Amazon, and eBay, Justin manages the purchasing, sales data, and fulfillment across all channels. He has worked with numerous inventory software programs from the likes of Brightpearl, ShipStation, Shopify, Amazon Seller Central, Netsuite, and Magento.